One of the world's leading oil and gas exporters is working closely with the University of Sheffield's Advanced Manufacturing Research Centre (AMRC) to establish its own version of the world-leading centre in a bid to diversify its economy and attract major foreign investment. AMRC Oman, known in-country as Intaj-Suhar, will be the first of its kind in the Gulf. Over the last two years, senior figures in Sohar University, Oman's first private university, have been working closely with their counterparts at the AMRC in the UK to develop the "clustering of university research with industrial design and production." The project will be developed in two phases. The first phase will focus on "advanced manufacturing" to support industrial innovations and "manufacturing tools" to support small and medium-sized enterprises and introducing new products. While the second phase is expected to be developed by private sector investments and will represent an added industrial hub to the region. The AMRC model has already been replicated in Denmark, Australia, Italy, the Netherlands, Germany and India. The centre's links to industry have been instrumental in the Sheffield and Rotherham area securing inward investment for manufacturing facilities for high profile names including Rolls-Royce, McLaren and Boeing. 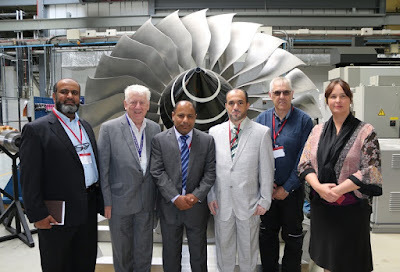 John Baragwanath, executive director at the AMRC (pictured, second left), paid tribute to the Omani government and the team at Sohar University for having the vision and drive to create a world-class centre focused on high-value added manufacturing. He said: "It has been a privilege to work with Oman in this remarkable venture. "As the originators of the AMRC model, we have been able to show them how world class research can help manufacturers of any size add value to their business by introducing advanced techniques, technologies and processes. What we are doing chimes perfectly with their vision of helping Oman become "a knowledge nation.""